Alaska remains a destination for vacationers who thrive on adventure. Cruises, caravans up the famously rugged Alaska Highway, and more real estate than Texas attracts visitors eager to see a countryside unfettered by industrialism and chock full of critters not available anywhere else except the local zoo. From May through August, Alaska is a wilderness traffic jam of buses, RV’s and rental cars crowding local attractions and padding the state’s economy. Come Labor Day, though, everything changes. Most tourist attractions shutter for the winter, tour operators pack up microphones for warmer climates, and the landscape undergoes a seemingly overnight transformation in preparation for a long winter’s nap. Then, and only then, residents of Alaska emerge like bears from a den, stretching and flexing and waiting with bated breath for one thing. Snow. Organic, crystalline, and just right for full-bore fun, kids included. 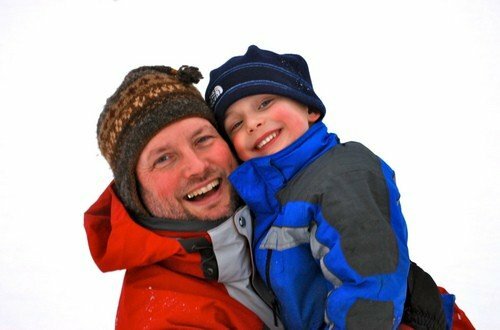 Alaskans don’t shut down when snow flies; on the contrary, they embrace it with enthusiasm for skiing, dog sledding, snow machine trips, ice skating, and snowshoeing. It’s Alaska’s little secret, winter. But they’ll let you in, provided you have a plan. While many states thrive on a bustling winter season full of snow-based outdoor recreation, it is probably fair to say none possess Alaska’s raw, unfettered wildness, an appealing trait for many a vacationer tired of the same-old, same-style trip. Take alpine skiing. Alyeska Resort, 50 miles south of bustling Anchorage, offers an average 631 inches of snow each year and takes the phrase “steep and deep” to another level. Views? Got ‘em, with picturesque Turnagain Arm and surrounding peaks flushed white or pink against often-blue sky, and seven glaciers visible from the top of the Upper Tram Terminal. 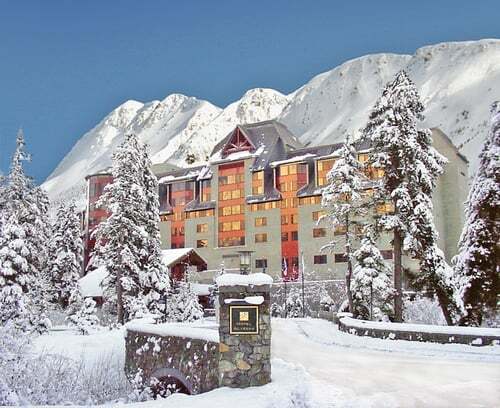 Alyeska has come a long way from an experts-only sort of place, the impression as recently as 2005, when new owners arrived and improved the entire property, making the resort truly a world-class family destination. Wide open bowls, more beginner runs, high-speed quads, and the addition of two “magic carpets” for young learners created an inviting atmosphere for skiers of all ages and abilities. Rounding out a stellar cadre of ski and snowboard instructors to the Mountain Learning Center, Alyeska began to rival the famous resorts of the Lower 48 for value and variety. With lift tickets costing $60/day for adults, $45/day seniors, kids 13-18, and $40/day for kids 6-12, a full day of skiing in the 49th state is more affordable than one might imagine. 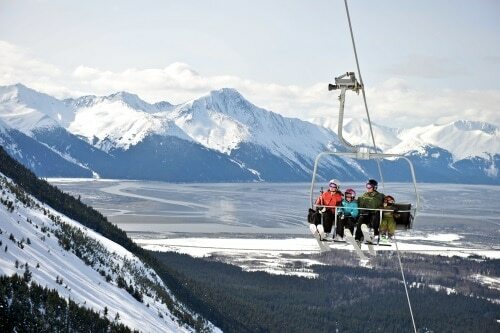 Nestled in the city of Girdwood (and part of the municipality of Anchorage), Alyeska Resort prides itself on combining traditional charm with modern-day conveniences skiers have come to expect from a high-end property. Hotel Alyeska, a 400-room, recently renovated to reflect a more modern theme, looks out upon the expansive Chugach State Park, our country’s third-largest state park at almost 500,000 acres. With a European feel, the property is equipped with everything a visiting family desires, and then some; swimming pool, hot tub, spa, and tons of nooks and crannies for game-playing, cocoa-drinking, or simple relaxation in front of a crackling fire. Three restaurants offer stellar examples of Alaskan-themed cuisine, but the Pond Cafe is the most kid-friendly with bear-shaped pancakes and “Kids Eat Free” deals that keep parents happy, too. Apres’ ski activities abound, too. Dog mushing tours can be arranged through the Hotel, giving guests a true Alaskan experience behind a team of sled dogs anxious to put on a show as they hit the trail, yipping and yowling. Snowshoeing and Nordic ski opportunities are abundant as well, with miles of wilderness right outside the hotel doors. Meet Girdwood residents in their element, skiing to work and play, kids often packed up cozily in their own converted jog strollers and pulled by mom or dad. When night comes and kiddos are full, warm, and nestled in their beds, take a minute to sip a glass of wine in front of the window and perhaps catch a glimpse of the Northern Lights streaking across the sky. Sometimes moody, sometimes glorious, the Aurora Borealis sums up an adventure to Alaska with a curtain call to Mother Nature’s grand design of the North. Erin Kirkland is a freelance writer and editor of AKontheGO.com, a web site dedicated to family-friendly destinations and activities in Alaska. She lives in Anchorage with her husband and youngest son, six.